The Rochester, Minn.-based health system reported total revenue of $9.45 billion during the first nine months of 2018, up 7% from $8.84 billion in the same period in 2017. Its expenses increased by 5.5% to $8.85 billion in the nine months ended Sept. 30. Mayo expects to spend $908 million over the next three to five years on ongoing construction projects related to patient care, research and educational facilities, given their progress as of Sept. 30. The health system is undergoing an expansion in Arizona that's projected to cost $648 million and be completed over the next three to five years. Mayo also projects it will spend another $217 million related to its installation of an Epic electronic health records system, which Mayo said it had rolled out across all its sites in October. Dr. Steve Peters, co-chair of that project, said in a statement that those costs reflect external consulting and internal information technology activities relates to the implementations in Arizona and Florida. The not-for-profit health system reported $601 million in income from current activities during the same nine-month window of 2018, up 32% compared with $455 million in the prior-year period. Mayo's net cash from operating activities jumped 80% to $671 million in the nine months ended Sept. 30, from $373 million during the same period in 2017. 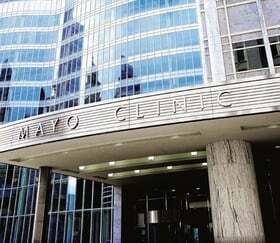 Seventy-two percent of Mayo's medical service revenue, excluding external lab services, came from its Midwest region during the nine months ended Sept. 30, compared with about 73% during the same time in 2017. Another 15% came from its Southwest region, and the remaining 13% came from its Southeast region in the 2018 period. Mayo, whose CEO, Dr. John Noseworthy, will retire at the end of the year, is in the midst of a 20-year implementation of its Destination Medical Center, a $5.6 billion project that's envisioned to serve as an anchor for medical center and research in Rochester.